Does this revamped Ibis stand out from the Avian flock? The demi-cutaway and fan fret design make this a unique offering. A punchy projection with plenty of attack. Limited range of tone for fingerstyle playing. The last 12 months have seen Avian undergo an extensive rebrand. Its logo has been refreshed, it has a new website and its previous 2015 range of guitars have been refined and fine-tuned into five new bespoke offerings. These new models were launched at this year’s NAMM show in California. They range from the French-inspired 19th century parlour guitar, the Dove, to the larger 28” scale baritone, the Falcon. Each model is offered either as a standard or deluxe version. The model up for review this month is the Ibis Deluxe Fan Fret, which has the largest body size of the standard range. The Ibis has been designed with the traditional large American guitar in mind and described by Avian as ‘simplicity personified’. The top is made from solid Sitka spruce (one of the largest species of spruce in the world) and has a light, even grain that contrasts well with the rich rosewood back and sides (Avian can also provide maple or mahogany back and sides on request). The binding and rosette are also made from rosewood, though with a darker grain to emphasise its curves and the position of the soundhole. There is a slice of maple sandwiched between the binding and the back and sides, a detail that helps give the guitar a feeling of luxury and finesse. However, there are three features which set this guitar apart from the pack. edge of the soundboard and side has been chiseled away, so you end up with an extra edge upon which to rest your right arm. It blends seamlessly into the edges that continue to circumnavigate the soundboard and upper and lower bouts, so it feels like a natural part of the instrument. It has also been capped with ebony, which helps to draw further attention to this feature. The second feature is a demi-cutaway, which is particularly slick. Not quite a semi-cutaway, it looks like someone’s taken a large bite out of the instrument, revealing more textures beneath the surface: as if the instrument is a solid block (which of course it isn’t). But there’s more to the meaning behind this design... It gives the left hand easy access to the above and beyond (the 14th fret). Under the hood, the body also comes with the standard X-bracing for acoustic models. The fingerboard has a unique set-up for the frets - and it is here where we find the third of the features. At the headstock end, the frets angle away from you, whereas the frets closer to the soundhole angle towards you. This is fan-fret design at play - a feature the luthier Michael Bashkins has chosen to employ for this model. The idea is that by extending the scale length for the bass at 660mm (compared to the treble length, which is a standard 645mm) the lower strings will have more room to vibrate, which typically suits drop-D and open tunings. The manufacturer describes this as having ‘quite a gentle fan - not drastic like other models.’ If you place the guitar on its back and look at it from an aerial perspective, the fretwork looks as though it has been inspired by a Kandinsky painting, with its juxtaposing angles, but compositionally it works. Elsewhere, there’s no Spanish heel. The guitar comes with a bolt-on neck made from mahogany and maple strip that runs the entire length into the headstock, which is decorated with a mother of pearl Avian logo. The overall design of the guitar is impressive to say the least, and certainly meets Avian’s expectations in its aim to craft instruments that are distinctive without being overly ostentatious. When in use, the Ibis produces a lively, bright sound. Flatpicking produces a responsive sound and the projection seems to double in size, compared to fingerstyle playing. There’s plenty of attack here. Rhythmic, chordal playing make a homogeneous sound - perfect for singer-songwriters who like to give it some welly, or whose vocals are particularly strong (when playing acoustically). Oasis, Green Day and other such 90s covers work a treat on the Ibis. The bright sound of the guitar provides a fitting contrast with our baritone vocals, though we’d like to hear how it sounds with female vocals. well with the sonic benefits of the fan-fret design. The low end does have a punch, aided by the fan fret design, but the sustain is in the upper and middle registers. Fingerstyle playing, on the other hand, doesn’t quite get the best out of its tone - regardless of how much we alter the angle or position of our right hand we can’t seem to find the sweet spot, and playing with the right hand over the upper end of the fretboard seems to be the closest we can get. To be fair, flatpicking and strumming were what Avian set out to focus on with this particular model. So although fingerstyle playing falls (mostly) flat on its face, this instrument is fine (if not very good) for karaoke style singing and playing. E string. As a consequence we have to drop my left elbow, drawing it slightly closer to our body in order to get that full, crisp chord heard. Much of this might be due to our classical training (wanting to keep our left arm at right angles to the neck), so we wouldn’t recommend this guitar to any classical purists out there. It’s a different story at the top end, though. The left hand feels so natural it makes you wonder why all guitars don’t have frets that lean to the soundhole. Combined with the demi-cutaway it makes for some simple top-end playing. The Ibis has a very low action too; it feels almost like an electric. With little effort we’re even able to bend the strings, Chuck Berry style. We reviewed the Ibis with a Blueridge 183N (£1,429) as a comparator, which also has a solid Sitka top with rosewood back and sides. You can instantly hear and feel how the Ibis’ forte is in rhythm, not fingerstyle playing. You can also feel the benefits of the demi-cutaway. The bass on the Ibis doesn’t seem to be as strong compared with the Blueridge, but then we’re dealing with a completely different guitar structure. 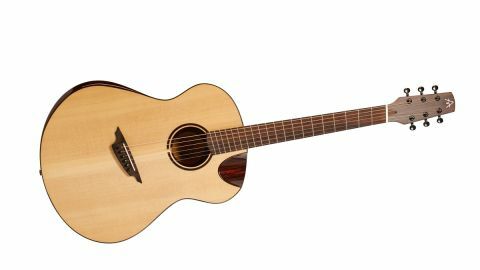 The Ibis uses B-Band Crescent II XOM as its onboard electrics, which is discretely positioned just out of sight in the soundhole. This is a dual-source system featuring both UST (undersaddle) and AST acoustic soundboard (soundboard) transducers. The AST sits somewhere between the bridge and soundhole, and the UST sits under the saddle, obviously. When testing the electronics we find that the UST has a more subtle change of tone whereas AST has a brighter and louder effect on the sound. We’d recommend steering the dial towards the former. For those not au fait with Avian, the company was started five years ago by two furniture manufacturers, Timothy Oulton and Roger Kimp. Their furniture reached an enviable list of clients including the likes of Harrods and Selfridges, but the pair decided they wanted to branch out into musical territory. Roger had a penchant for guitars, so together they put their craft and resources towards a new venture, enlisting the help of the accomplished luthiers Michael Bashkin, from Colorado, and Harry Fleishman, from California. And so Avian was born. While this is, to all intents and purposes, an American shaped business, the Ibis is actually built in China, where Bashkin set up the Avian workshop. All of the guitars are bench-made - there’s no factory based set-up going on here. With an RRP of £1,619, the Avian Ibis, distributed by The North American Guitar in Europe, is a significant investment for the acoustic guitarist, but it does come with a fitted hard case and boasts top-notch features. It has the design and verve to wow audiences and feels and looks like it’s capable of much more in terms of tonal quality. The Ibis is easy and fun to play and has a punchy, rhythmic sound - ideal for accompanying vocals. When you look at some of the artists who play Avian guitars, from Starsailor frontman James Walsh to Olly Mur guitarist Ben Lyonsmith and Spandau Ballet’s Gary Kemp, you can see how these guitars have been best used. The Ibis feels like it’s intended to cut through the mix of ensemble playing, with the ability to give some clean flatpicking when necessary. It’s the perfect guitar to bring an acoustic presence into a larger, multi-instrument band, blending well with male vocals, and providing a percussive backdrop to a larger musical canvas.